The best candidates have them in abundance but they’re hard to define, harder to identify and even harder to demonstrate. It is a wonder therefore, that they’re called soft skills. So, what are soft skills and how do you go about identifying them in a candidate and presenting them as a job seeker? Many of these skills will be essential for the workplace and identifying which ones are most important for each role is not always obvious. LinkedIn published a 2017 Global Trends Survey which claimed that 35% of recruiters believe that the evaluation of soft skills will be the driving force in the future of recruitment. 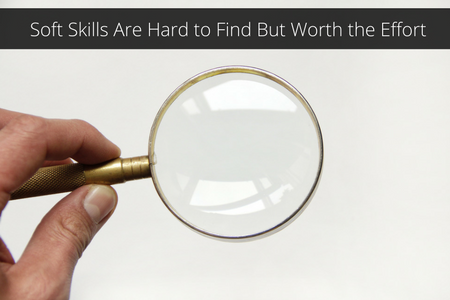 If recruiters find soft skills hard to assess, candidates have a similar challenge when trying to communicate to the hiring manager that they possess both the technical and non-technical skills required to do a great job. Applicant tracking software is now very sophisticated and can identify technical skills with ease, but how do you identify someone who is particularly emotionally intelligent or has great integrity? Stating on your CV that you can code is easily verifiable but you can’t say you have an A- in common sense, you really have to be able to demonstrate it. The interview is the best environment to identify and demonstrate soft skills, but preparation on both sides is essential. An interesting question is whether soft skills are innate or can be learned. There has been criticism in the press recently from industry complaining that school leavers are lacking any useful soft skills and blaming the schools for not equipping them adequately, implying that such skills can be learned. Schools are often excellent at teaching the technical skills and practical skills needed to apply for a job such as CV writing and interview practice but should they actively teach soft skills too? Aricia E. LaFrance, in her article Helping Students Cultivate Soft Skills argues that soft skills are habits that have been cultivated over time more than they are innate traits. If children have great role models, be it parents and/or teachers, they will learn by association and will understand the value of such skills by experiencing them and then feeling inspired to copy and follow examples of when to apply them. As some people possess some soft skills and not others, it could be argued that individuals may have a predisposition to certain attributes, leadership or strategic thinking skills for example, rather than have an ability to learn all soft skills equally. Are we really saying that soft skills reflect your personality? Or is it the other way around? Do extroverts tend to possess soft skills such as leadership skills and strategic thinking while introverts are better at listening and negotiating skills? There is probably no definitive answer and the interviewer shouldn’t assume that there are any personality/skills stereotypes. Are there some soft skills that are easier to assess than others? Arguably, the easiest and most important skills to assess would be ease of communication and teamwork or leadership skills. Resilience and positivity would probably be two of the hardest, because it is difficult to assess in a candidate but also many of us are pretty bad at being honest with ourselves about such skills. We can all pretend to be positive but feel anything but when faced with rejection or bad news. Many of us spend little time thinking about which soft skills we possess and when faced with a detailed job description, how many of us analyse which soft skills would be best for that role? Soft skills have not been given the importance they deserve in the past whether on job descriptions or during an interview, but hopefully with an increased debate on the subject, hiring managers and candidates of the future will be more aware and prepared to assess and celebrate these most valuable of life skills.